Learn how to create a retro comics effect in Photoshop in just a few easy steps. For the comic book effect I will use a Photoshop comic book template, textures and filters. The Photocopy filter is great for creating comics. You can use it to create cartoon photo effects also. Add this Comics Book Template in Photoshop. You have to download the high size image; this is a PNG image with transparency. Go to Image > Canvas Size. Check Relative option and increase the size of the width and height with the same number. Create a new layer behind the Comics Book Template and fill it with white color. Use the Rectangle Tool to create three rectangles behind the Comics Book Template, like shown in the preview. The color is not important. Add the Baseball photo above the first rectangle layer. Right click and choose Create Clipping Mask. Go to Filter > Artistic > Poster Edges and make the settings that you like to create a comics book effect. You can choose the black line edge thickness and intensity. Also you can set the posterization level. To adjust the contrast and the brightness, add a Levels adjustment just for this layer. Right click and choose Create Clipping Mask. For other images you might have to adjust the settings. Using the same technique add the other two photos: Baseball team and Baseball Player Shortstop . 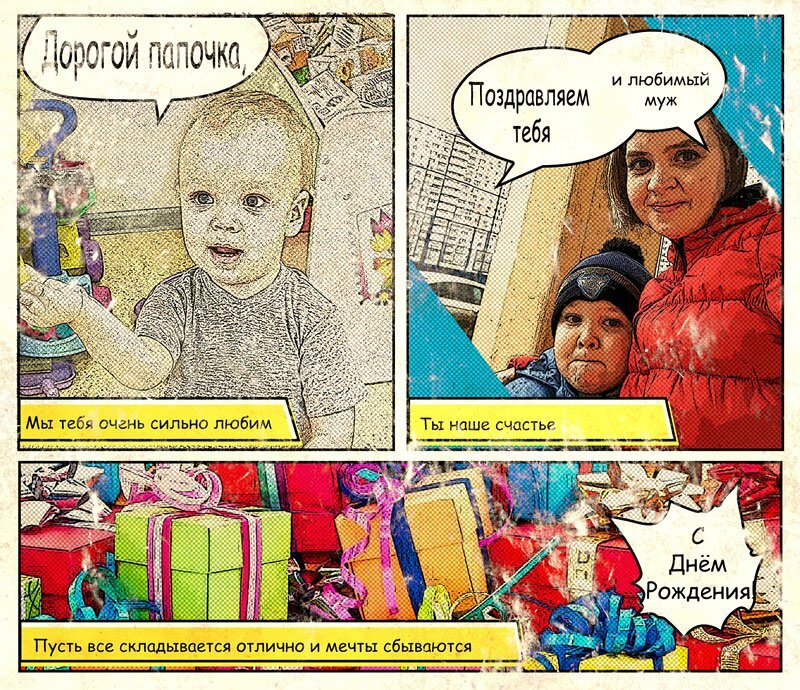 The comic book template has speech bubbles that you can use to add custom text. I used a simple black Arial font for adding some text. To create the distressed effect in Photoshop, add this Grunge Texture in a new layer. Set the blend mode to Pin Light. Open the layer style window of the Grunge Texture layer and make this setting to hide the black tones. Add a Levels adjustment. Right click and choose Create Clipping Mask. To create the old paper effect in Photoshop, add this Grunge Stained Old paper Texture in a new layer. Set the blend mode to Multiply. To add more contrast to the old paper texture, make a Levels adjustment. Right click and choose Create Clipping Mask. For the final adjustments you can add a Levels for all the layers and made the image more bright. You can also increate the contrast, increase the saturation, etc. Also you can sharpen the image using the High Pass Filter Technique. 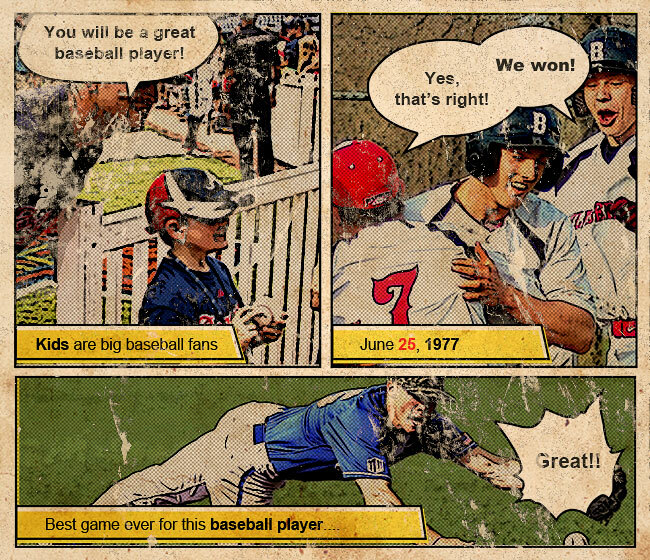 So here is the final result for the retro vintage comic book effect made in Photoshop using textures overlays. 3 comment(s) for "Create a Retro Comic Book Effect in Photoshop"